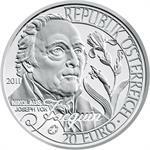 Home > eurozone > austria > silver coins > 2019 Austria €1.5 Silver Bullion Coin "Vienna Mint 825 Years: Wiener Neustadt"
2019 Austria €1.5 Silver Bullion Coin "Vienna Mint 825 Years: Wiener Neustadt"
The second of three coins celebrating the 825th Anniversary of the Vienna Mint is dedicated to Wiener Neustadt. The three coins celebrating the 825th Anniversary of the Vienna Mint are all linked to the ransom paid to Duke Leopold of Austria for the release of King Richard the Lionheart of England in 1194. They also all contain one ounce of fine silver, the precious metal used to pay the huge ransom, which was partly used to build the stronghold of Wiener Neustadt – the theme of the second coin in this very special series. Unlike most other towns, Wiener Neustadt did not develop gradually over time, but was founded and constructed for strategic reasons on barren land at the easternmost tip of the Austrian Alps, south of Vienna. A fortified town, it was designed to help secure the duchies of Austria and Styria from the Kingdom of Hungary. The town features on the reverse of the coins, while the obverse features Leopold V’s equestrian seal, which shows him as a military commander on horseback with a shield and a banner. The original image can be found in the Monastery of Heiligenkreuz, near Vienna. This obverse is common the all three coins in the 825th Anniversary of the Vienna Mint series, which can be traded at the daily silver price, yet also feature a design worthy of a coveted collector piece. 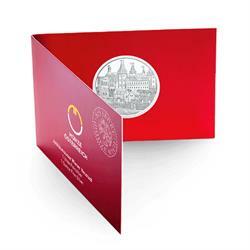 As such they can be considered as both investments and collector coins. 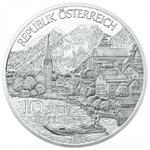 2016 Austria €10 Silver Coin Issue "Austria Piece by Piece: Upper Austria"
2011 Austria €20 Silver Proof "Nicholas Jacquin"
Austria's contribution to eurostar program "European explorers"